My brother's best gal pal and her boyfriend came over for dinner. We started talking about city/world events and politics. I had nothing to contribute so I felt dumb. Maybe I should start watching the news. I've had serious Vegas withdrawals and had a hard time adjusting back to regular life. Although I had a fun time, I think it could have had more potential (I was out of it for most of the trip, due to a hangover after the first night, and lack of sleep from too much adrenaline). I really wish for three of my friends to find that special person, a significant other. All of them are wonderful people who are having a hard time finding someone to date. I wish them nothing but the best. I've slacked off this month with blogging. I'm kinda out of ideas. I've even lost followers because I'm probably that boring. Not gonna lie and I know I have no right to get angry because there's a million names out there but I hate when random people steal my baby names. lol! There is a particular friend whose friends name their baby the names that are on my list. And yes I'm crazy because I am by no means pregnant. I ate about seven sliders last weekend and I don't even like burgers. I only watch So You Think You Can Dance to see Tadd's performances. I hope he wins this season. After Vegas I became obsessed Down on Me by Jeremih and now it's Out of my Head by Lupe Fiasco and Trey Songz. I've mastered fishtail braiding my hair but only if it's a side braid. Here is my lame attempt at ombré nails and at taking a decent nail photo. This week's nail art was inspired by the lovely Lauren Conrad who pulled off the brilliant shades of blue. I tried to go with purple but realized I didn't have enough similar shades to use, hence why one nail has a shade of pink and one white. I am really bad at taking photos of my nails so if you have some tips on what I should do so my hands don't look so old and wrinkly or like man-hands, please leave me a comment. Keep in mind, I don't have a high tech SLR camera. Okay, asides from loving my hubby, my family and friends, my home, my bags, my makeup and TV and music...you know all the obvious ones, here are some things that I love right now and maybe will always love. Beach vacations. More specifically that cool breeze from you get in the afternoon while lying under a palapa. Random text or email. When friends just send a text or an email for no reason but to simply say hello. Twitter. Who cannot love this social networking tool. I love communicating with companies this way, meeting new people and just having funny conversations with friends. iPhone. It holds my life. I never really want to depend on it but it's become a part of me, like another limb or an extension of my arm. Nail polish and nail art. Some people can be so creative with their nails. Although I don't push the envelope with this, I do enjoy painting my nails once a week and trying out new colours or designs. This new blog I am following has been providing some awesome inspiration. Anything white and gold. I am eyeing this Foxy Sahara ring which I will probably buy tomorrow. Robin Thicke. I could listen to his music forever and I hear (from his Twitter account, obviously) that he has a new album in the works. Zara Colour Wallet. I have been using this wallet all summer. I love it. I kinda wish I bought the yellow one too. 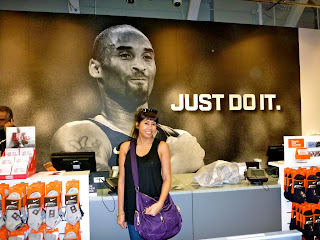 Okay, so I didn't meet Kobe but my mom snapped this photo of me in front of a huge mural of him. 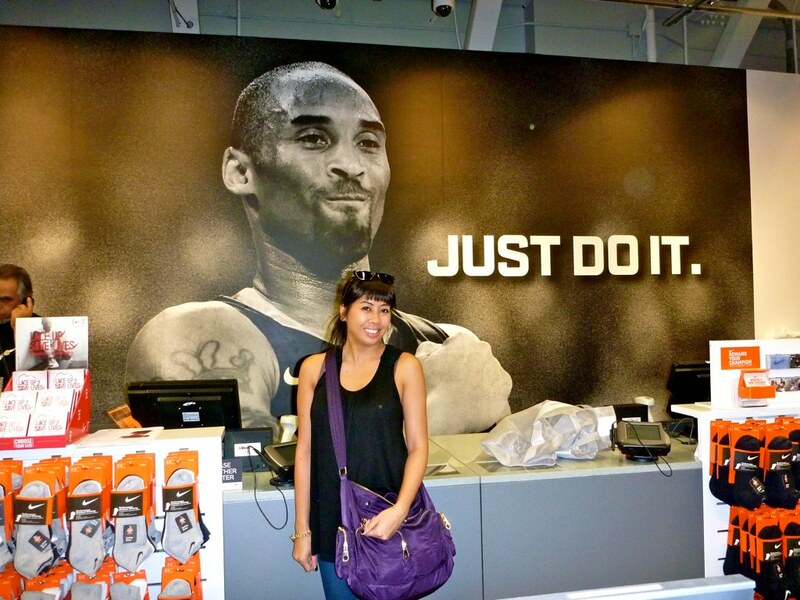 I have been wanting to share this photo with Reni since we both share a love for our favorite Laker (we also share a love for our L.A. gal, Lauren Conrad). I thought Monday Memories would be the perfect opportunity to post this photo. So, Reni, this one is for you! 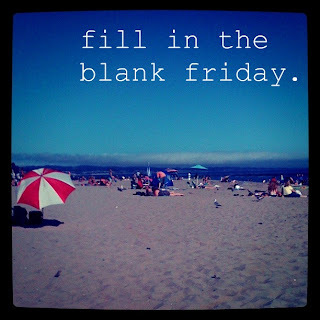 These days, I don't have much to blog about so an easy way to fill the void is to join a blog series. I came across 10 Day You Challenge on After I Do. I love reading men's magazines - GQ, Details, Men's Journal - I find them much more enjoyable. It's not only because of the photos of hot guys but it's also the interesting, yet funny articles. I can't fall asleep if it's dark. I need some type of night on, a street light, night light or the TV. But when I am really tired and need to sleep in, I will sleep with an eye mask. 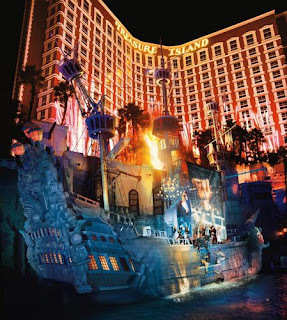 I like anything that is lit up at night like pools and especially Las Vegas. I like to take photos of weird or gross things I come across on the GO train. Sometimes my commute is boring if I don't feel like reading, so taking photos and tweeting them makes the ride more exciting. I'm addicted to TMZ. Although I don't think it's right to harass celebrities, I like watching this show. It's funny and entertaining at the same time. I keep a journal by my bedside. If I feel like to need to talk to my brother, I write in it. I remove my makeup with baby wipes. I am most of the time too lazy and tired to take off my makeup so the wipes are quick and easy and a surefire way that I will do it before I go to sleep. I want to be a dancer. I specifically wish I was a b-girl. I plug my ears and hum when a trailer for a scary movie comes on while watching TV. To be exact, I hum Loving You by Minnie Riperton (starting from at the 45 sec mark). If I work past 4 pm in the summer, I wear sunglasses. The sun comes shining into my work station at 4 pm and with it glaring off the computer screen and the fluorescent lights, it hurts my eyes. So I throw on my sunglasses. Yes, I look ridiculous hence why I leave at 4 pm everyday. Nail Art is all the rage. As you know, I love painting my nails and if I was patience enough, I would love to do designs on my nails. Maybe I have inherited this trait from my mom because she does all sorts of designs on her nails. I swear, she could work at a nail salon. I loved the Black Shatter I got on my nails for Vegas and as much as I wanted to go to the salon to get a different colour combo for tonight, I opted to do my own nails (I'm broke). I choose Chanel's Black Satin polish with Sephora by OPI's Traffic Stopper Copper. I know black is a little too much for the summer but I love the way it looks, plus I plan to remove it and go coral when I go back to work on Tuesday. It's Friday! This was the first full week I worked since the beginning of June and it will also be the last full work week for this summer. I have taken a day off each week until the Labour Day weekend. Awesome isn't it? And I will still have 17 hours I still need take off. Crazy! Today is Mr. Dee's birthday and tomorrow we are going out to celebrate his 35th birthday. Each year when we go out for his birthday, it's signals that summer is half over. We are going to a restaurant I have been eyeing for some time, AME. I can't wait to eat dinner and also catch up with some friends I haven't seen in a while. My mother-in-law's birthday is on Monday so Mike and I will be going to his parent's house for a BBQ. I love hanging out in their backyard - drinking, playing with the kids and eating. No, I don't drink while I play with the kids...I am not "that" kind of aunt. I don't feel like doing work today so after I finish this post, I hope to have some fun on Pinterest, write some posts for my travel blog and maybe schedule future posts for this blog. And if I am lucky, maybe Mike will watch a movie with me. Stay cool everyone (if you are living in a place with a heatwave) and have a fabulous weekend! Now time for some blanks, join in the fun over at Lauren's blog. 1. One of my happiest moments ever was my wedding in Punta Cana. Having every single one of my family and friends on vacation and also to witness Mike and I get married is something that will forever go down in my books. Also, any vacation I take with Mike makes me truly happy. 2. Summer is wedding season and weddings are overrated. People spend a ridiculous amount of money for one day. I get it's memorable, it's a once in a lifetime event but really, a destination wedding is the way to go. You can party with your friends and family for a whole week, it doesn't have to end after one night. 3. This summer has so far been a whirlwind. A trip to Punta Cana, my mom's month long visit, Vegas with the girls and we are only halfway through the summer. I can't wait for the second half but it's going by too quickly. 4. My summer food of choice has been salsa and chips. So refreshing. I should really make my own instead of buying Jack's Special Salsa. 5. My summer uniform has been rompers or dresses. I want more of both so I am not repeating my outfits so often. 6. If I could spend the entire summer in one location I would choose Punta Cana because it feels like home there but then again, I would like to stay somewhere in Mexico and eat Mexican food all day. 7. My summer anthem is Give Me Everything by Pitbull, Nayer and Ne-Yo. I have so many other songs I like but this one got me hooked before this summer started. I have seen many tattoo posts on the blogs lately and I wanted to share mine with you. Never in a millions years did I think I would get a tattoo. On my 30th birthday, I had serious thoughts about getting one secretly, like not telling anyone and just doing it. Well, I chickened out and then years went by. In July 2007, Mike and I were walking around downtown and passed by a tattoo studio, Blackline Studio Tattoo. We went in to check it out and then I sat outside debating about it. One of the girls came out and showed me what I could do with the tattoo I wanted and asked me to come back in. I felt like I should just take the plunge and do it. So I did and out I came with two little stars on my left wrist. Mike was proud of me that I actually did it and was kind of jealous that he didn't end up getting one. Later we found out that my old high school friend's younger brother is a tattoo artist and he comes to your home to do it. Mike scheduled a session in August 2007 and since I get home before Mike, I got a dragonfly on my right ankle. Can you believe I didn't feel anything at all and actually fell asleep while he was inking me? I love this tattoo and I really like the placement more so. 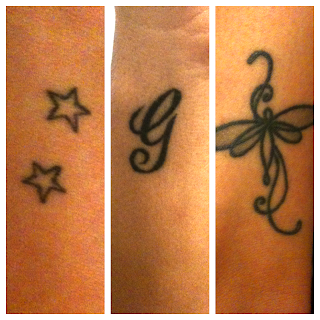 Now after my brother passed away in in June 2008, I went and got the letter "G" tattooed on my right wrist a few months later. I had a dream about my brother visiting me (as a ghost) and he had a "G" tattooed on his neck. As soon as I woke up, I attempted to do a quick drawing of it so that I could eventually get it somewhere on my body. I thought that putting it on the side of my wrist was a place where no one would see it but I was wrong. When I am sitting at a table, with my elbows propped on the table (yes, I know, bad manners), I always get asked what "G" stands for. At first it was hard to tell people it's in remembrance of my brother who passed away but now I am use to it. I definitely want another tattoo, not sure of what but I have something in mind. Actually I have two more in mind. I just have to find the time (and money) to do it. 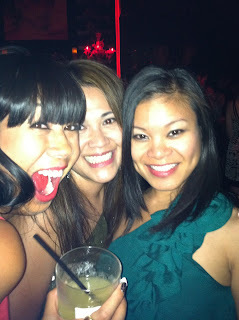 One of my 34 things to do while I am 34 is to go to Las Vegas with a bunch of girls. Not only was this a trip to cross off my list, it was a chance to meet two fellow bloggers and celebrate the birthdays of two lovely ladies. I have been to Vegas before with my hubby for my mom's wedding but this trip was totally different. I was trashed on the first night at Tao, running on 24 hours straight with no rest. I then slept until the afternoon and missed going outlet shopping with the other girls. My mom surprised me with two bottles of champagne and chocolate covered strawberries to share with the girls. I sat at dinner at Koi on Saturday night unable to eat anything so I barely drank anything later at Marquee. But then after Coke and a slice of pizza at 2:30 am, I got a second wind and danced until my feet could dance no more. I slept for 45 minutes that night, or should I say that morning. I had a huge rush of adrenaline I could not contain. The whole trip was capped off with the Jabbawockeez show and a celebrity (in my eyes) sighting, along with a photo for proof. It was a whirlwind weekend, something that will go down in my books and the only thing I have left to say...when are we going to Vegas next??? SUV Limo cuz that's how we roll. Kidding. Elisse negotiated a really cheap rate on the spot. I didn't get my beignets but these mini donuts will do. First photo of the group taken on the way to Fashion Show mall. Deer in headlights at Tao. Anthony, the birthday boy. He turned 23, what a little baby. The guy on my left with the glasses, Brian from the O.C...he bought a shot for me and Maur and is the sweetest guy I met in Vegas. Damn that birthday boy ruining our pic. Hungover the next day. I'm surprised I made it outside to walk around with Maur. My mom is the sweetest. She sent over some champagne and chocolate-covered strawberries for me to share with the girls. Drinks at Koi. Even though I was feeling sick and didn't eat dinner, I still managed to drink my drink. On the way to Marquee. Birthday girls are in pink. We ran with Brian from the O.C. again at Marquee. What are the odds? Maur and I with Greg. He got us into Marquee and also gave me my second wind of the night by buying pizza and soda at 2:30 in the morning. Almost drunk, well I think miss vodka_and_soda is drunk. The show was awesome. It's a must in Vegas. Highlight of Vegas for me - meeting D-Trix (From Quest Crew and So You Think You Can Dance) and Lauren (last season's SYTYCD winner). I saw on Twitter that D-Trix was going to take Lauren to see Jabbawockeez so I tried to look for them throughout the show. When the show was over, Maur and I maneuvered out way around the back and quickly snapped a photo with them before security caught us. It was a great weekend. I am shocked that we pulled off this mini blogger meet up to celebrate Reni and Maureen's 3?th birthday. I had an awesome time ladies. Maur - you are an awesome roomie and you will forever be my partner-in-crime, we always have fun no matter what. Kat - you are a shopping machine. I'm glad we asked you to be part of this meet up and that you jumped at the chance to party in Vegas (there was no need to twist your arm). You are hilarious Miss vodka_and_soda! Steph - I can't believe you caved in doing you know what but we are in Vegas, and what happens in Vegas, stay in Vegas...you are a super jackpot party queen, too bad you didn't start playing the slots earlier in our trip, you could have partied and become a millionaire (with pennies). Reni & Elisse - it was such a pleasure to finally meet you two but when we saw you at the airport running and screaming, it's like we were seeing old college friends. Doesn't it feel like we have been friends for ages? You guys are awesome and I am so thankful we pulled this blogger meet up together. Hopefully I will be able to make it out to Portland and Vancouver soon. That wraps up AS 2011. It was fun while it lasted but it's back to the real world. Because I am being way too lazy to type up my Vegas report, here's a little snippet of photos from my trip with Maureen, Kat, Steph, Reni and Elisse. Stay tuned for more photos and my recap. Sweet Elisse and her little gift for us girls. How I felt the next day from staying out partying too late. The damn slot machine I went on a wild goose chase to play for my mom. I lost $5. Our first drink of the night. Whacked out airplane attire. It's cold on the plane. Before going to Las Vegas, Maureen and I had a mani/pedi date at LV Nail Spa. How fitting that we are going to LV and getting our nails done at LV. I wanted to do something Vegas inspired but I always wanted to try doing the Shatter on my nails. After trying out many colour combos (pink with black shatter, pink with purple shatter, pink with white shatter and white with pink shatter), I finally settled with gold with black shatter and boy did it ever look awesome! As pleased as I was with my nails, with two top coats, it didn't last very long. By Friday night, it was already peeling off but luckily with the shattered look, it wasn't that noticeable. I will definitely do this look again! p.s. Vegas post coming soon. I'm just too lazy to type it out but I will get to it, hopefully on the weekend. By the way, Las Vegas with the girls was awesome!!!! By the time you read this, I will be on a plane with Maur to meet the other Asian Sensation girls. This trip was in the works late last year and I can't believe it's actually happening. Yesterday we were treated to Kat's husband and my husband totally making fun of us on Twitter. I wish there was some way I could post their string of conversations because it made all of us laugh so hard on our commute into work. This is a well-deserved trip for all of us and for most of us, our first out-of-town blogger meet up. I am 100% positive we will have the most awesome-est time EVER! I know when we come back, our blogs are going to blow up with photos and stories. I can't wait to stuff our faces, watch Jabbawockeez and hit the clubs. p.s. Steph & Jay, I will be thinking about you on Saturday. My mom left to move to California 10 months ago. I was sad when she left but then I got use to her not being around. Of course, she would call or email me almost every other day and I had the pleasure of visitng her in November. Now from June 7 to July 5, she came here to visit me and the hubby and her 10 million friends. She was able to squeeze short trips to Ottawa, London, Niagara and Stratford (yup, she was looking for Justin because she too has Bieber fever), as well as spend some time with my brother's friends. I took three days off work and spent any free moment she had to hang out with her . My mom is a busy-body, like every other mom, she can't sit still. If she wasn't with her friends having lunch, playing golf or tennis while she was here, she would be cleaning my condo, doing our laundry, ironing, cooking, basically all of our chores. She treated me and Mike to every meal we went out to eat, she bought us groceries, she bought me a Kobo Touch. She even gave me lots of money to take on my trip to Vegas. On her last day while she was at our condo waiting for her flight, she was trying to make our bed and got so frustrated with our duvet. She walked with my stepdad to the mall and bought us a new duvet and boy is it ever comfy! It was really nice to be treated like a kid again and be taken care of by my mom. And I'm not gonna lie, I milked all of it but now I am paying the consequences because I don't want to cook or clean. She spoiled us and now we are suffering. 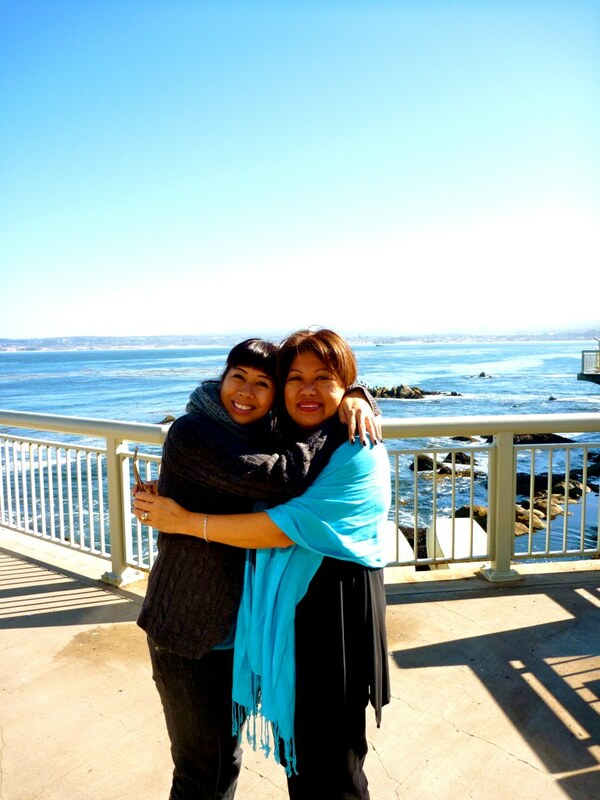 I don't want you to think I miss my mom because of all the things she did or bought for us. I miss her because she's kinda funny (she's quirky like me) and we always have a good time with her (and my stepdad). Talking on the phone with her and emailing is just not the same. It was good to see her in person and even hug her at random times. I hope that I get to see her again this year, maybe I will (or Mike and I will) visit her in California around Christmas time. I know if anything, she may be back again next year for another visit but I have a secret way to get her to come sooner if I need to see her - I'll just book my eye surgery so it will force her to come and take care of me. Does your mom live far from you? If so, how often to you visit each other? We are lucky enough to have friends who have a gorgeous pool. They invited over the day after Canada Day to go for a swim and a BBQ. Jes and Richie invited all of the BC Crew but only half of us could make it. Of course, Mike and I who live the close to an hour away were the first to arrive. We were welcomed with lots of hugs from their three little boys. There are barely any photos of the adults and I forgot to take photos of all the delicious food we ate. We see the whole crew probably twice a year, once at Christmas and once on Mr. Dee's birthday in July. If we are lucky, we get to each other at a summer BBQ or a birthday party of one of the kids. After spending the day in the pool, we said that this is what it would be like if we did a 10 year Cancun reunion with the kids. (btw, the 10 year passed last year, we should have gone May 2010). We had some good laughs, good eats and it was just nice to catch up with everyone. What a day! It took me about 5 hours until I went into the pool. After everyone ate dinner is when I finally decided to go in. Some of the kids went back in but it quickly got cold. We were hoping to go for a night swim but it didn't get dark until 10 pm. And crap, I forgot to take a picture of their pool all lit up (and you know how I adore lit pools). P.S. It's a saltwater pool!!! !